My epic week of cooking the leftover ham finally paid off with something awesome and delicious. 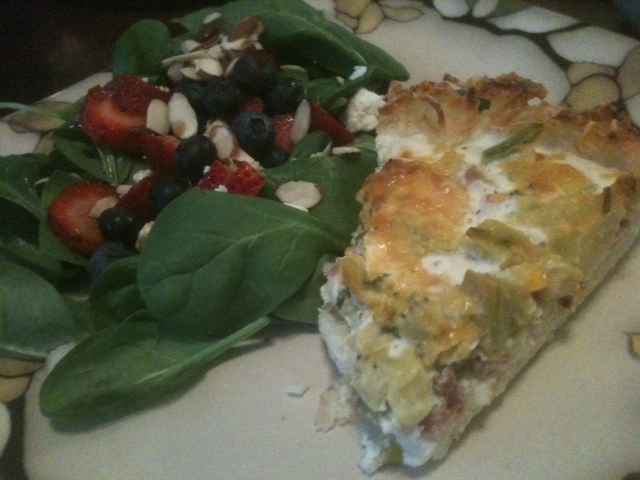 This healthy quiche was so good! I got to have some last week while the Hubs was off on a business trip, but I’m excited for him to get to taste it tonight. I paired it with a balsamic spinach salad topped with strawberries, blueberries, almonds, and crumbled feta. This was the perfect recipe to welcome Spring (though, admittedly, it totally snowed that evening. Oh well). I cannot take credit for this recipe. 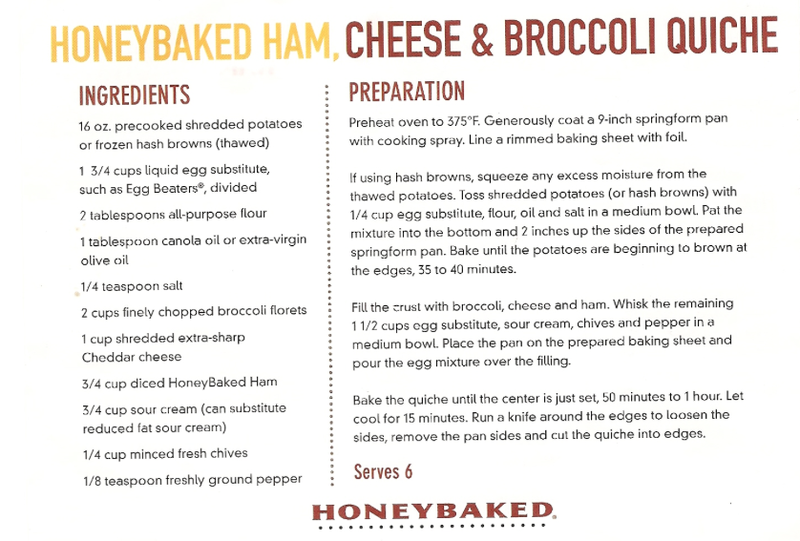 My mom emailed me a scan of a recipe card she got from the Honey Baked Ham Co. where she purchased her ham. Again, let me emphasize. AWESOME. Did I mention that the crust is made out of tasty hash browns? I’m so glad we have another one of these in the freezer for later. The only thing I did different in the recipe is that I used liquid egg whites instead of egg beaters and I definitely used fat free sour cream (okay..I used “light” in one and “fat free” in the other. They didn’t have two containers). Anywho, try this asap. I posted the recipe card below. 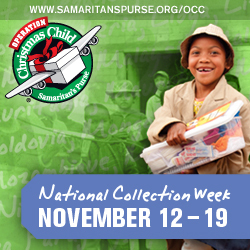 be sure to pin on Pinterest! Everyone needs to enjoy this quiche! It’s THAT good. *Note, the slice of quiche pictured above is actually LESS than a serving size. The recipe calls for 1/6 of an 9 inch spring form pan. This is about 1/8. *Note: the image above is actually smaller than the recommended serving size.